Last night the West Virginia men’s basketball team put forth a disastrous showing in Lubbock. How bad was it? WVU made nine field goals. In the game. Were there any bright spots? Well, Derek Culver had 23 points and 12 rebounds. Most of his damage was done at the line, going 15-of-24. The next highest scorer was Jordan McCabe with seven points. He was the only player besides Culver with more than one made field goal. The turnover nightmare continued. West Virginia committed 26 turnovers in the game. Esa Ahmad, Culver and Jermaine Haley led the way with five turnovers each. Despite not entering the game, walk-on Logan Routt managed to make the headlines by allegedly tripping Texas Tech guard Matt Mooney on purpose after he attempted to block a shot and flew into Routt on the Mountaineer bench. The refs decided it was a Flagrant 2, which results in an automatic ejection. Routt acted as if he didn’t do anything but he was escorted to the locker room. It’s hard to gauge intent. What do you think? I have to admit it looks like he trapped his leg and tripped him on purpose. I don’t know Routt personally and I could easily wrong, but that’s what it looks like to me. There were many different reactions on Twitter. Some people can’t believe that as nice of a guy as Routt would do that while others attacked him for one of the dirtiest plays they have ever seen. Logan Routt is perhaps the nicest kid on the #WVU roster. Weird sequence there. Hard to gauge intent. Was he tripping the player or crossing his legs to avoid contact? 2018 gave us Wes Harris left-hooking a fan. 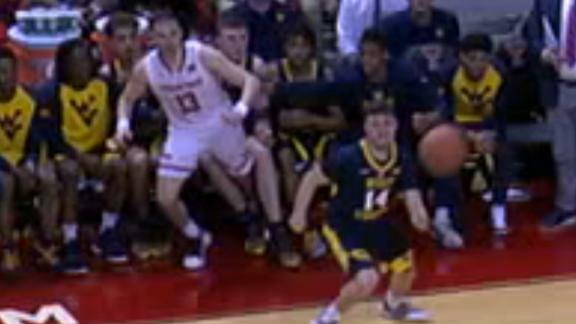 Let’s talk about Logan Routt making the dirtiest play in college basketball history. Down by 22, Logan Routt is ejected for WVU for tripping a TTU player while Routt was sitting on the bench. That's probably where he should stay for a few games. Logan Routt= classless, disgrace to Coach Huggins and program, should of never received scholarship ! Routt isn’t playing on a basketball scholarship, but we get your point, John. Regardless, this team has so many issues. Huggins has burned through the entire roster trying to find a spark from someone. There is no one left to turn to. Unless Sagaba Konate re-emerges as the second coming of Hakeem Olajuwon, this team is winning another game or two best case. Moving forward, what does this team have to build on for next year? Culver will definitely be the centerpiece, but you need more than one person to make a team. Bolden can’t stay on the court. This team will need massive improvements from McCabe and Knapper in the backcourt and the continued development of Lamont West and Wes Harris. Up next, the Mountaineers take on Texas Saturday night at 8 p.m. on ESPN2.